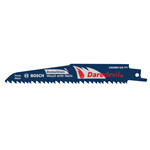 The DareDevil line of tool accessories by Bosch combines creativity with unsurpassable boldness to deliver a selection of top performing reciprocating saw blades, circular saw blades, auger bits, and spade bits. Inspired by the Godfather of Freestyle Motocross, Mike Metzger, every DareDevil accessory is built to “Work Hard, Play Hard” at every extreme. Every DareDevil accessory must be the best-in-class in at least one of the following features: speed, cutting ability, or ease-of-use. 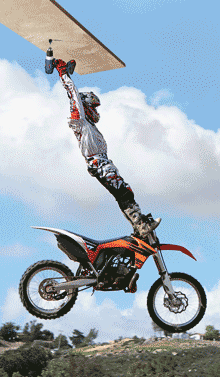 Experience a bold, daring, and captivating performance now on your jobsite. 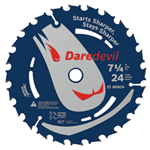 DareDevil's circular saw blades are designed with an extra-hard body so that the blades never bend. Designed with C3 micrograin carbide, these blades will stay sharper longer and resist impact damage longer. They also have a signature Speed Coat finish that reduces friction and pitch so that cutting will be even more efficient and effortless. To reduce kickback and extreme heat, these specific blades also feature control cut shoulders and body slots. In addition, they have a thin kerf design allowing for faster cuts and less waste. The triple sharp teeth allow for not only an extremely fast cut but a perfect finish everytime. To avoid warping, these blades have been built with revolutionary espansion slots. These blades are truly the best-in-class in cutting speed. These circular saw blades are available in a wide selection of sizes and packs, making them perfect for the contractor, professional, or heavy duty do-it-yourselfer. Click for full DareDevil circular saw feature diagram. The cutting speed and durability of DareDevil reciprocating blades is top-of-the-line. With patented two-by-two tooth geometry, these blades have the ability to cut up to 20-percent faster through metal. They also have a variable tooth pitch of 5/8 teeth-per-inch, increasing the speed of chip removal while making smoother, more precise cuts. The teeth have also have a micro-blast treatment applied to them that preserves the sharpness of the blade and furthers the precision of the cutting edge. To increase durability, these blades have a powder metal steel alloy to resist higher temperatures as well as a titanium coating to reduce heat build-up. In addition, the body height and thickness of these blades have been increased to ensure straighter cuts with reduced vibration. These reciprocating blades are available in a wide selection of sizes and packs, making them perfect for the contractor, professional, or heavy duty do-it-yourselfer. Click for full DareDevil reciprocating saw feature diagram. Bosch's DareDevil spade bits have drilling speed and force that sets them in a performance class of their own. Designed with a patented full cone threaded tip, drilling becomes fast and effortless for these bits. Also unique to these bits is the spur and reamer feature that allows for drilling of cleaner holes. In addition to these features, the contoured paddle design is what really sets these spade bits apart from the rest of the market. 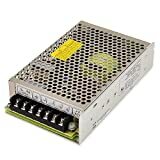 This design allows for chip removal to be reached at higher speeds than ever. With chipping speeds this high, DareDevil has added a hex shank power groove at the end of the bit to further reduce slippage during use. These spade bits are available in a wide selection of sizes and packs, making them perfect for the contractor, professional, or heavy duty do-it-yourselfer. Click for full DareDevil spade bit feature diagram. Nail killing auger bits are signature to DareDevil in their best-of-class nail-hitting ability and user ease. Built with dual cutting edges and a reinforced tip, these auger bits balance easier nail cutting and accurate drilling with the power to withstand repeated nail hits. To ensure the quality and accuracy of both entry and exit holes, these auger bits have been built with a reamer edge. To improve chip removal, these bits have an open-faced flute design. 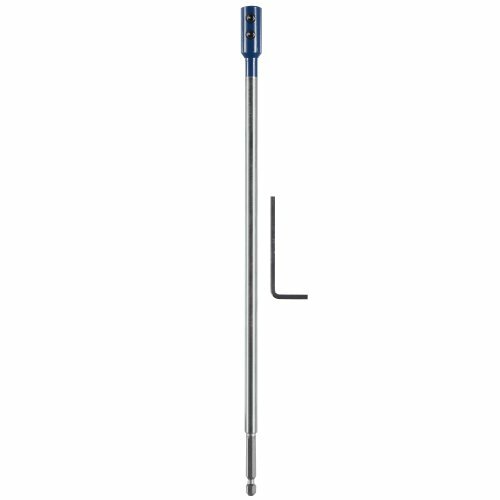 They also have a reinforced spine for that crucial extra strenght needed when performing heavy-duty application. All of these features combine to decrease the torque impact on nail hits by up to 61-percent while increasing the life of nails up to 9-times. 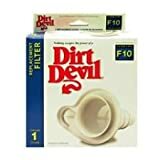 These auger bits are available in a wide selection of sizes and packs, making them perfect for the contractor, professional, or heavy duty do-it-yourselfer. Click for full DareDevil auger bit feature diagram. All DareDevil accessories are backed by a one-year limited warranty. In the instance of manufacturer defects, the item will be backed for one full year by the warranty. Damages caused by use of the product are not covered under the warranty. HSS Aircraft Extension Drill Bit Size: 1/4" x 6"